NTH performed finite element design services for the analysis of a distressed sewer, located at a depth of 60’ below the ground surface. The concrete sewer walls had eroded, and an analysis was performed to see if the loss of wall would place the sewer in danger of collapse. NTH performed a soil investigation of the area, and took cores of the concrete walls and tested them to determine concrete strength and actual wall thickness. 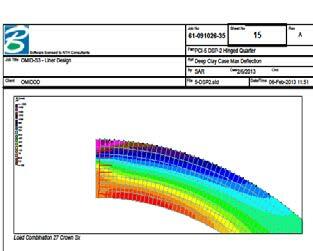 This information, combined with the known inner diameter of the sewer, allowed us to prepare a finite element model of the sewer wall, based on actual conditions. The sewer ran several miles, and 11 locations were analyzed. The sewers were originally constructed as an ellipse, with differing inner and outer diameters. As a result, the wall thicknesses and diameters changed for each location. An excel spreadsheet was developed so that the input text for nodes and plates would be provided as a direct output in an excel generated report. This output could be directly copied into the STAAD Pro editor so that plates and nodes would be auto-generated. A comprehensive finite element analysis was performed for each of the 11 locations. It was determined that only one of the locations was in imminent danger.